Golf is one of the most popular sports in the world today. Integrating entertainment and golf into one,Golf enables you to enjoy the nature and get away from urban pollution while playing. The charm of golf comes not just from the fun of the game itself,but also the beautiful scenery of the course,which fascinates and attracts a lot of golf lovers. Golf course is generally built on the open lawn of a gentle slope on the hilly ground. And the artificial afforestation and unique ornament unify the natural scenery and modern building as a whole. Some Courses even include a part of ecological conservation. However,how to protect these pieces of wide and open grass? The Golf Sport Event Tent from Liri Tent provides the perfect solution to you. Widely used in golf sport events for the auditoria,restaurant,lounge and other scenes. Its unique design enables you to fix the tent on the course in a flexible way without damaging the ground structure like the traditional architecture did and it is quick and convenient to assemble and dismantle. Applying membrane materials,the golf sport event tent make you intimate to nature with the soft and downy light penetrating inside,just the same as outdoor. Besides,meeting the need of indoor lighting without turning on lamps and lanterns during the day,by which saves large amounts of electric energy. It is environmental friendly and a good control of the operating costs. 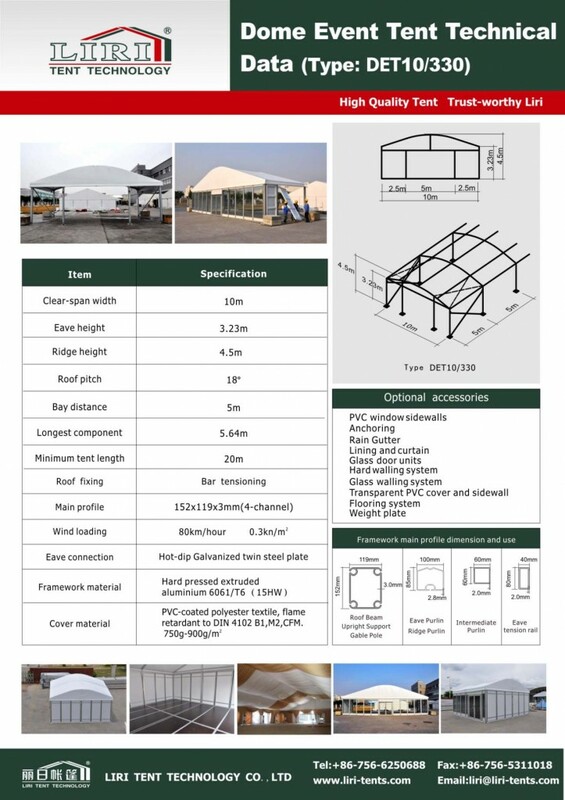 This is tent is our 10m clear span Arcum Dome Tent, which is made of main profile is 152x119x3.5mm, please check the the technical data.